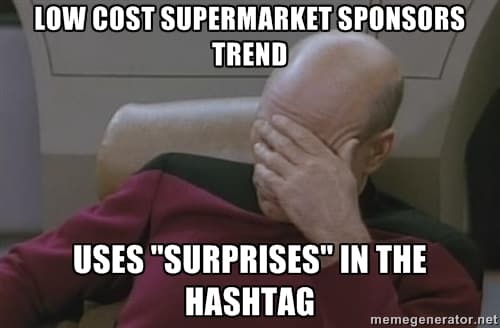 German discount supermarket chain Lidl is sponsoring a trend on twitter in the UK today, using the hashtag #LidlSurprises – so what could possibly go wrong? Lidl normally do a good job advertising, and the TV campaign that this sponsored trend is backing will no doubt be high in TVR spend – meaning those of us in the UK will see it most nights for the foreseeable future. If I were managing social media at a bargain basement supermarket chain with national reach and recognition, I’d probably want to err on the side of caution on this one. Twitter is a fantastic platform for social magnification and viral campaigns – its not however a great platform for controlling the message you want to portray. Any marketing manager before shelling out a reasonable amount of money, particularly in a very high visibility medium must be to perform a full SWOT analysis on any such media buys, social media included. Value brand, good quality/cost ratio, austerity friendly. Perceived class demographic, questions over how low price points can be met, in-store presentation. Capturing valuable twitter demographic consumers. Twitter users taking the p*ss in every possible way (as twitter users tend to). What Can Brands Learn From This? For goodness sake brands, please stop sponsoring trends that allow even the slightest chance of it being hijacked for hi-jinx! I assure you the twitterverse will find a great way to make you look stupid. If you can laugh at yourselves (I’ve a feeling Lidl probably can) then its not so bad – especially as your perceived social media faux-pas might get some headlines, but unless this was made clear as a potential goal internally in advance of the campaign, you’re going to have a rough day. Providing the social media team/agency did advise that this was the likely outcome, and the brand signed off on it, then its likely to be a success in terms of visibility and followers. Who knows, maybe Lidl are in fact just trolling us on this one! Whoever paid for #LidlSurprises promotion is either new to social media, or has a strong stomach. This will get messy ???? I mentioned on Twitter, but I think they probably ran the risk analysis & still concluded this was a good idea. The ‘#WaitroseReasons’ campaign was v similar (albeit I don’t think it was sponsored, just brand-prompted), and the results of that were pretty good. I think they did the numbers and the risk assessment – they could be on the verge (if they can handle the tongue-in-cheek stuff) of running it like the Skoda publicity shortly after the new models arrived with Volkswagen’s ownership. Overall I’m inclined to give the brand the benefit of the doubt, personally can’t see them going for a full blown tongue in cheek campaign. Their push at the moment being to promote the brand away from discounter to mainstream status is more likely to see luxury than humour being the primary focus. If they do go down that route, I’d be happy, brands overall need to spend less time taking themselves seriously. @David yup, the marketing press had it last week, now the campaigns live mainstream business press will probably feature it tomorrow. Whether it moves from the back to the front pages depends on whether any traction is achieved with the social media campaign – and the wrong kind of traction specifically. It wouldn’t be a bad thing for them of course long term. Humorous but as marketeers we often jump to conclusions, the old adage any news is better than no news can and does ring true. There are many brands that have benefited from apparently negative social media coverage just look at Ryanair over the years for example – the negative press and social reactions probably reinforced loyalty from their typical customer bases – their not going to Lidl for premium feel good products either. People have short memories http://www.economist.com/blogs/gulliver/2014/09/ryanair-and-business-travellers and for me the only real long term harm is when you mix marketing with life or death subjects like http://www.smh.com.au/travel/travel-incidents/malaysia-airlines-mocked-for-bucketlist-challenge-20140903-10bz1p.html – now that is really worth learning from.